Home | Testing Blog | What is Reliability Testing? When it comes to answering these questions, the concept of time-based quality becomes relevant with regard to Reliability Testing. Incorporating the two facilitates the process of identifying and estimating a product’s overall lifespan by exposing it to various environmental conditions. There are a number of tools and methods (statistical and non-statistical) available to estimate a product’s lifespan, but which one should you use? The following article will answer this question and more with first explaining what Reliability testing is followed by the various types of testing involved. We are familiar with quality control testing, where a product is subjected to quality test checks to uncover defects. However, with Reliability Testing the objective is to 1) test the endurance of a product under certain conditions, 2) identify the failure rates and 3) if applicable, propose preventative measures that can increase the product’s reliability and lifespan. In short, Reliability Testing–like quality control testing–is performed to provide confidence that the product meets its reliability requirements. And the next step for a product to meet its reliability requirements is to go through a Reliability Test Program which consists of a series of integrated tests. The Reliability Test Program integrates three types of tests: Reliability Development/Growth (RD/GD), Reliability Qualification (RQ) and Product Reliability Acceptance Test (PRAT). The Duane Method is a non-statistical method that uses graphical techniques. At each failure, the accumulated test time is calculated and the cumulative failure rate (total failures/total test time) is plotted against accumulated time. The growth rate is determined from the graph. The AMSAA uses statistical method assuming that reliability growth is a non-homogeneous Poisson process, where number of failures in an interval of time (or cycles, miles, etc., as appropriate) is a random variable distributed in accordance with the Poisson distribution. During the Reliability Qualification Test phase, a product is tested under certain conditions to determine if it complies with its specified reliability requirements. If a product is in compliance then it’s approved for production. Note: When planning a Reliability Qualification Test, it is best to ensure that the configuration is representative of the production units. Once a product is approved for production the next step is to perform the Product Reliability Acceptance Test (PRAT). The objective of a PRAT is to detect any inherent degradation in a product’s reliability over the course of production. Note: During the PRAT, cumulative product operating time and product failures should be recorded and plotted on the chart for acceptance and rejection of the product. Part II – What Test to Use and how is it Performed? In this section we will briefly explain what type of test to perform and how it is performed. An excellent guidance document to reference is the military handbook, MIL-HDBK-781: Reliability Test Methods, Plans and Environments for Engineering Development and Production (mentioned earlier in the RD/GD test section). Although the MIL-HDBK-781 was primarily developed for defense contracted procurements, many of the test methods, plans and environments can be tailored to suit other products and equipment. While test conditions and the levels of test are determined by the product’s operational life profile, the MIL-HDBK-781 stipulates that a test is to be performed under the combined influence of electrical power input, temperature, vibration and humidity stress. Before deciding on the type of test to perform, it is important to identify the appropriate equipment category of the product to be tested. Defined in the MIL-HDBK-781 are six (6) broad equipment categories (see below) that help specify what operational requirements to use. After the equipment category has been determined, product testing can now begin. The purpose of the Combined Environmental Reliability Testing (CERT) is to evaluate the reliability of the product in the environments that they will be used. Through CERT, products are exposed to multiple environmental factors that include vibration, thermal (temperature) and humidity; the time duration and number of test cycles (fatigue testing) are dependent on the product type (i.e. equipment category). When evaluating a vibration stress test, if the equipment is not packaged specifically for transportation, the equipment shall be subjected to single frequency sine-wave vibration at 2.2g at a non-resonant frequency between 20Hz and 60Hz for 20 minutes before start of the reliability test. For the thermal (temperature) stress test, the equipment shall be subjected to specific ambient temperatures (no cyclic temperature requirement). Cold soak temperature of -54C and hot soak temperature of +85C can be incorporated in the profile, if needed. Humidity testing is not performed, unless specifically required. The duration of the profile is normally 24 hours or an evenly divisible fraction thereof. Note: The MIL-HDBK-781 specifies that CERT be performed for all six equipment categories. 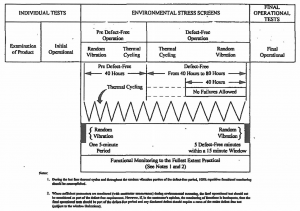 Environmental Stress Screening (ESS) is another important aspect of Reliability Testing. ESS is a process where products are subjected to higher levels of vibration, thermal, humidity and electrical stress to precipitate either design defects and/or early failure characteristics. 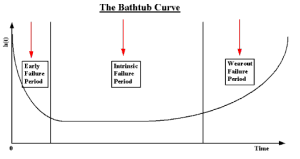 The concept of ESS can be explained through the Bathtub Curve shown below. In the Bathtub Curve, the failure rate is plotted over periods of time for the product population. Described below are the various time periods when testing a product’s failure rate. The first period is the early failure or infant mortality period, where defective or weakest products in the population have started to fail. As the failed products are being replaced or repaired, the failure rate comes down and becomes constant. During the useful life period, failures occur randomly. Other names for the useful life period are constant failure rate period or intrinsic failure. After the useful life period, the products start to fail more frequently due to wear and tear and fatigue. This period is called the wearout period due to the increase in failure rates. Now from a customer point of view, the early failure will not be acceptable. The manufacturer shall eliminate the early failure, as best as possible through design, redundant component, derating, etc., and also through ESS. As stated earlier, during ESS process the product population is subjected to higher level of stress than normal operating stress to initiate early failures. MIL-HDBK-781 specifies the sequential series of stress cycles consisting of vibration or thermal or both vibration and thermal. 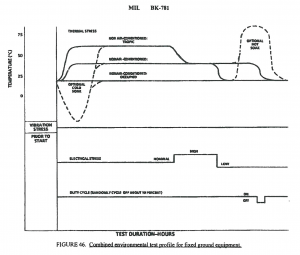 Another guidance document, MIL-HDBK-2164: Environmental Stress Screening of Electronic Equipment, goes into more detail about 1) the specific environmental conditions including duration, screening fixtures and monitoring as well as 2) the Failure Reporting and Corrective Actions Systems (FRACAs) of the ESS process. During this period, the defects found shall be repaired and counted but shall not be counted against the acceptance of product. With the power on, the product shall be subjected to thermal cycling for a period of 40 hours. The low and high temperature extremes are defined by equipment specifications. The dwell time at extreme temperatures shall be determined from thermal map/survey (average time over two samples cycles when 2/3rd of thermocouples reach within 100C of maximum operating temperature). The average ramp rate shall be 100C per minute. After completing the Pre Defect Free Period (for a fixed duration), the product is again tested during the Defect Free Period and subjected to the same vibration and thermal cycle conditions stated above. With the power on (operational), the product will be subjected to 40 consecutive defect-free hours under thermal cycling conditions within an overall screening period of 80 hours maximum. Following the 40 hours of defect free thermal cycling, the product shall withstand five (5) continuous minutes of random vibration without failure within a maximum screening time of 15 minutes. Note: In the above ESS process, vibration and thermal cycling are not applied simultaneously but in sequence. A new development in ESS is the Highly Accelerated Stress Screening (HASS) process. Unlike the traditional ESS process, HASS applies temperature and vibration stress concurrently with greater levels of stress. Because HASS applies a greater level of stress for both temperature and vibration testing compared to traditional ESS testing, test times are shorter and the tests more effective at detecting early failure. Note: The levels of stress applied for temperature and vibration during HASS are determined beforehand. In determining whether or not a product will perform in a certain environment, it’s important to remember the concept of time-based quality. By subjecting a product through various types of tests, and at different phases of development, a product’s reliability can be simulated and observed of how well it will perform over time. Introduced briefly in this article are the various types of tests involved when conducting a Reliability Test Program such as the Reliability Development/Growth (RD/GD), Reliability Qualification Test and the Product Reliability Acceptance Testing (PRAT). Covered at the end of the article was the Highly Accelerated Stress Screening (HASS) test which is unlike the traditional ESS process. For questions related to this article or to find out how NTS’s Chicago laboratory can help qualify your products, please call (847) 934-5300 directly or email Jit Gupta at jit.gupta@nts.com.